نیچل نیکولز (اینگیلیسجه: Nichelle Nichols) آمریکالی اوْیونچو ۱۹۵۹–گۆنوموز ایللر آراسیندا سینما ساحه‌سینده چالیشیب. 1964 The Lieutenant Norma Bartlett "To Set It Right"
Batman: The Animated Series Thoth-Khepera "Avatar"
2000 Futurama Herself "Anthology of Interest I"
2002 Futurama Herself "Where No Fan Has Gone Before"
2004 The Simpsons Herself "Simple Simpson"
2007 Heroes Nana Dawson "Kindred"
↑ Swift, Andy (2016-07-26). Y&R Beams Up Star Trek Alumna Nichelle Nichols for 'Emotional' Role. 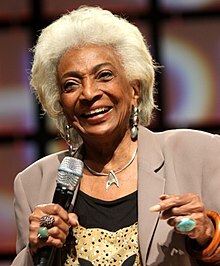 اینگیلیسجه ویکی‌پدیاسی‌نین ایشلدنلری طرفیندن یارانمیش«Nichelle Nichols»، مقاله‌سیندن گؤتورولوبدور. ( ۲۱ دسامبر ۲۰۱۷ تاریخینده یوْخلانیلیبدیر). قارداش پروژه‌لرده نیچل نیکولز گؤره داها آرتیق بیلگی‌لر تاپابیلرسینیز.